As one of the events managed by the CNCF, VEXXHOST is thrilled to have been a sponsor for KubeCon + CloudNativeCon. During this week, we announced that in addition to our Kubernetes-as-a-Service offering being certified by the CNCF, we became Silver members of both the Linux Foundation and the Cloud Native Computing Foundation. 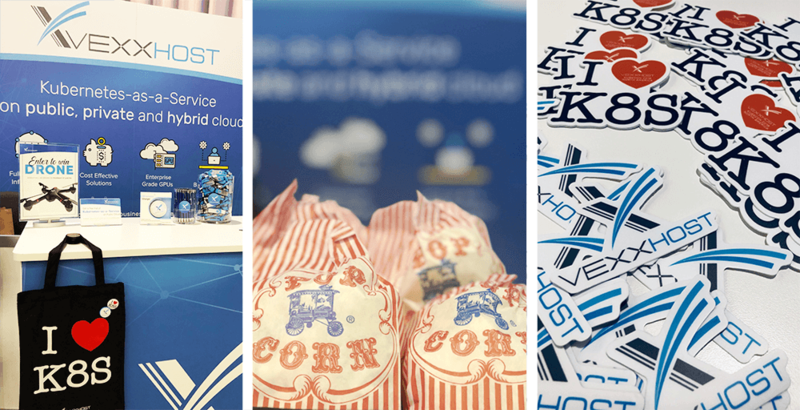 During the Booth Crawl that took place on the first day of the event, the VEXXHOST team served up some fun pop-corn, carnival style, to all hungry attendees. Additionally, with this having been VEXXHOST’s first KubeCon + CloudNativeCon, it was important for us to commemorate the event and what better way than with some “I ❤ K8s” memorabilia! We gave away all of our themed pins, stickers and tote bags and are glad that they were such a hit. We were also excited to see that our open-source partners, Kata Containers, was in attendance. As a supporter and donator, VEXXHOST is proud to see them, as well as other open-source community members, thriving. Another exciting announcement surrounding the event was the induction of Phippy, Zee, Goldie and Captain Kube into the CNCF. These characters were created to explain to both technical and non-technical individuals the open-source container-orchestration that is Kubernetes. They made their first appearance in the book “The Illustrated Children’s Guide to Kubernetes” and recently released the sequel, “Phippy Goes to the Zoo: A Kubernetes Story”. Check back with the CNCF to stay notified for their next group adventure! 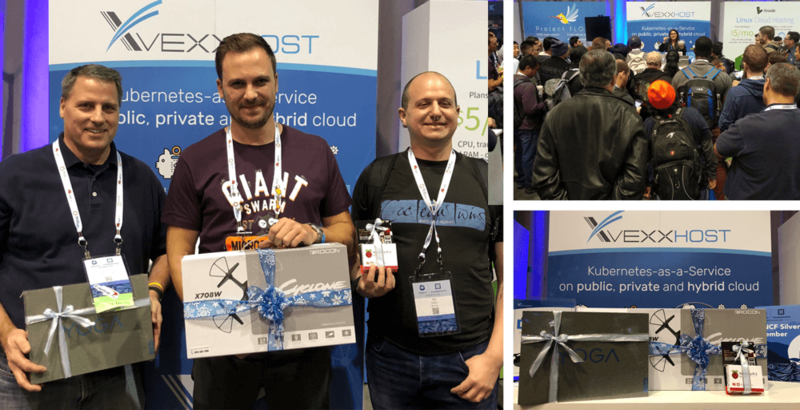 VEXXHOST would like to congratulate our giveaway winners, Tal Liron from RedHat, Simon Potgieter from Giant Swarm GmbH, and William Marquardt from Capital One who went home with a Raspberry Pi 3 B+, a drone and a Lenovo Yoga C630 Arm 64 laptop. We’d also like to thank everyone else who participated in the raffle. We had a blast and hope you all did as well! 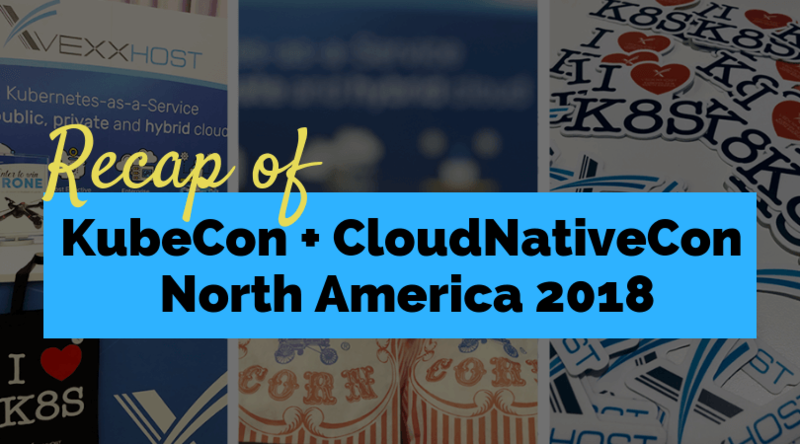 Our team had such a great time at KubeCon + CloudNativeCon North America 2018 and we appreciate all those who stopped by our booth, whether it was to strike up a conversation, ask a question, or to simply say “hi”. The activities, such as the All Attendee Party, hosted at the Space Needle, the Museum of Pop Culture, and Chihuly Garden & Glass, were incredible too! It’s safe to say that our first KubeCon + CloudNativeCon was a success, and we hope to see everyone again next year!